What do a grown man dressed in a school uniform, Rocky III and a death-defying base-jumper in a wingsuit have to do with the world’s toughest ocean race? Team songs, that’s what! As the final count down to the Iberdrola In-Port Race on October 29 starts, the teams competing in the 2011-12 Volvo Ocean Race have revealed the songs that will become their signature tunes at leg starts, finishes and in-port races. Team Sanya have chosen Eye of a Tiger by Survivor, inspired by the first Chinese sailor to take on the Volvo Ocean Race Teng Jiang He, better known as Tiger. 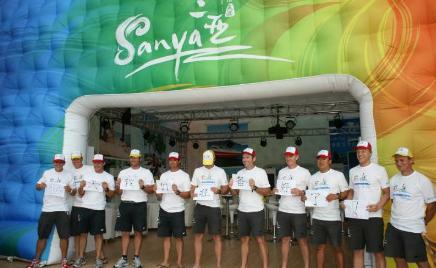 It is a punchy choice from Sanya, given that it served as the theme music for Sylvester Stallone’s third Rocky movie. CAMPER with Emirates Team New Zealand went with I See Red, which is by New Zealand band Split Enz and matches the red boat and her forever changing sail wardrobe. Groupama sailing team have gone for some classic rock, picking Highway to Hell by Australian rockers AC/DC, whose frontman Angus Young is famed for his school uniform stage outfit. PUMA Ocean Racing Powered by BERG’s have chosen a track by newcomers AWOLNATION called Sail. The team picked the song not only because of its words, but also a crazy YouTube film featuring the song and a madcap base-jumper. Team Telefónica will play Cada Noche, a Spanish pop-song that was written by local sailor Jaime Anglada. After much deliberation, which included considering MC Hammer’s U Can’t Touch This, Abu Dhabi Ocean Racing have gonefor She Sells Sanctuary by The Cult. The team’s Commercial Director David Hassett said the team took a diplomatic approach to choosing a song, calling for preferences from the shore crew and sailing team before running a poll. "We wanted a song with impact, something that makes people get to their feet because it’s the song that’s going to play when we leave and when we arrive," he said. "Of course, you can’t please everyone at every stopover, but we hope that we please most." Volvo Ocean Race Events Coordinator Johnny Donnelly said often song choice was a difficult decision for teams, with sponsors, culture and varied opinions all coming into play. He said a good song was one that had a fast tempo, a good melody and the ability to get a crowed excited. "I will never forget the finish in Galway in the last race when Ericsson 4 won the leg and there were 15,000 people screaming, and then Metallica’s Enter Sandman started playing," he said. "It was one of those moments like the analogy where they say ‘life’s not about how many breaths you take, it’s about how many times it takes your breath away’ and that’s what happened. It still does now when I hear that song on the radio."